It's unlikely LEGO will ever produce an H.P. 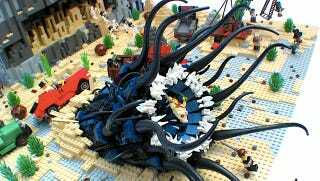 Lovecraft-themed line of LEGO sets — what with the cosmic abominations and the creeping madness and unholy geometry and all that jazz —but that hasn't stopped several intrepid builders from constructing their own eldritch play sets. Here are a dozen scenes inspired by the Cthulhu mythos. Unfathomable extraterrestrial gods are downright adorable when they're made of wee Danish building blocks. And if your taste for science fiction dioramas has yet to be sated after all this, here are some extraordinarily gonzo ones. And finally, a commercial for one such set — thanks, Refraction!